7 tips for dealing with scaffolding outside your NYC apartment. An interactive Department of Buildings map shows there are currently more than 9,000 sidewalk sheds active in the city. 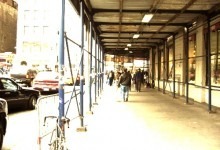 These street-level structures are meant to protect people from debris falling from construction scaffolding, but they also block light and make the sidewalks harder to navigate. No surprise that they are, on average, up for nearly a year. Still, while New Yorkers are used to dodging scaffolding on the street, it’s another thing when it goes up outside your bedroom window. 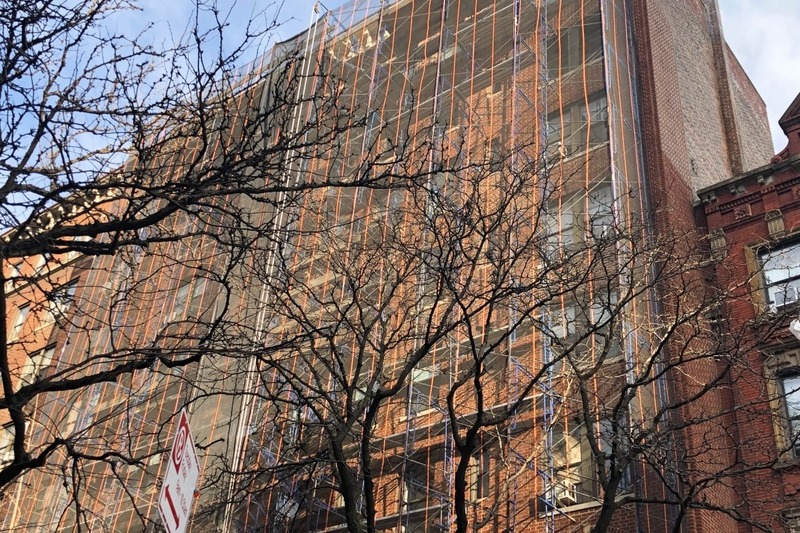 If your building is one of thousands with an active construction permit or undergoing facade maintenance, you’re likely asking how you’ll deal with the lack of light, privacy and the security concerns that scaffolding brings, to say nothing of the dust, bricks, shovels, pipes, and tarps. We have some advice to get you through. Work on the front of a building often involves grinding out the masonry joints, which can produce very fine dust. Don Wilson, president of Blue Woods Management, says locking the windows down to make sure they are firmly closed, is the only way to keep those fine particles out of your apartment. "Just shutting the window isn’t enough, and if it’s left even slightly open, you’ll come home to a mess,” he says. If you have an opportunity to get involved in decision making, press for the work to be done using a platform on cables that rides up and down the building. Wilson says this is better for residents than pipe scaffolding, which crisscrosses the building and is draped in a curtain. “Most residential buildings don’t use pipe scaffolding. Sometimes it can be faster, which might be a reason why a building uses it, but you have the side effect of blocked light. The black netting is a requirement, which helps prevent things falling but it does make it darker," he says. 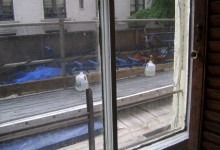 Tarps, planks, pipes, and pulleys replace the view from this Upper West Side apartment, also shown above. Solar shades use fabric designed to provide a degree of daytime privacy but light still passes through so you can still see out. If you've got workers on platforms outside your living room, these are a low-cost privacy solution. At night the effect is reversed so when the lights are on, the shades look opaque to you but you'll be visible from the outside. 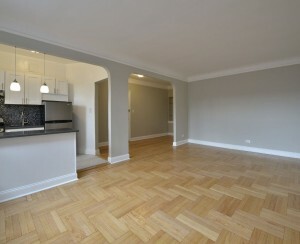 Full spectrum lights offer a color temperature as close to natural daylight as possible. Installing a range of lighting in your apartment will go some way to tacking the lost light as a result of the pipe scaffolding across your windows. Personal Organizer Meryl Starr recommends LED lights. "They're the brightest and best bulbs. I would use those in every fixture and purchase a floor lamp or two if space allows." If you're prone to seasonal depression from a lack of daylight there are light therapy boxes that can help. New York City is noisy, but having workmen outside your bedroom window is going to take it up a notch. While specialist soundproofing is expensive there are other options like adding drapes or investing in some noise-canceling headphones. Consider buying some earplugs—there's one to eliminate every kind of nuisance noise. "Even the best-planned project can take longer than expected," says Wilson. 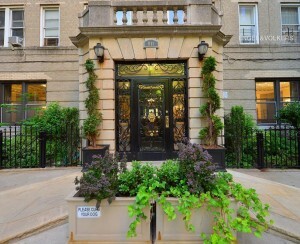 And don't we know it—one renter on the Upper West Side had scaffolding outside her window for more than five years. Wilson blames this on the fact contractors often discover the project is bigger than originally thought once they get underway. He also cites cumbersome inspection procedures that prevent scaffolding from coming down promptly. Two years ago council member Ben Kallos proposed a bill to limit the amount of time scaffolding can be up but he faced pushback from building owners. The bill is yet to pass. 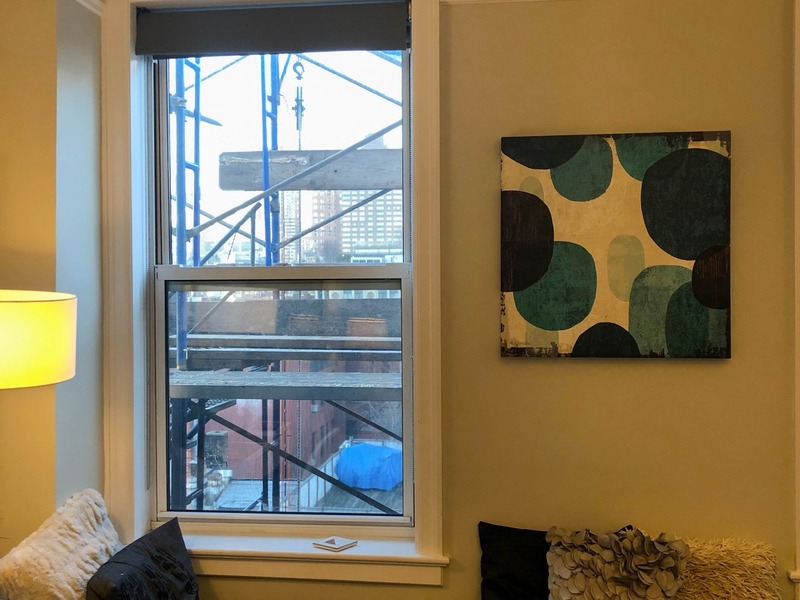 Do renters deserve a discount for scaffolding?